The debate over the merits of the Trans Pacific Partnership is likely to play out in Canada and other TPP countries throughout 2016. While it seems likely that the treaty will be signed in early February (February 4th is the earliest possible date for the U.S. to sign), decisions on whether to ratify the agreement will extend into 2017 and beyond. I’ve already posted some thoughts on the TPP’s digital policy implications (and spoken about the issue in this speech and on this panel) but wanted to expand on the trouble with the TPP in more detail. 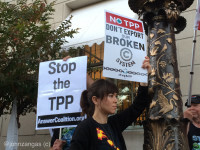 With that goal in mind, I plan to post each weekday until February 4th on problems associated with the TPP. The series will include posts on copyright, privacy, Internet governance, and many other issues.